“Bisa cepat, ya?” Catharina and Brooke urged as the sleepy cab driver motored out of Makassar’s Hasanuddin Airport. Their flight from Kendari, Southeast Sulawesi, had landed two hours late and the overnight bus to Rantepao, the commerce hub of Tana Toraja, was scheduled to depart at 9 p.m. — whether they were aboard it or not. Catherine and Ron were already there waiting, begging the bus driver to wait just a bit longer, a rare request in a place where transport is often run on jam karet, or rubber time. 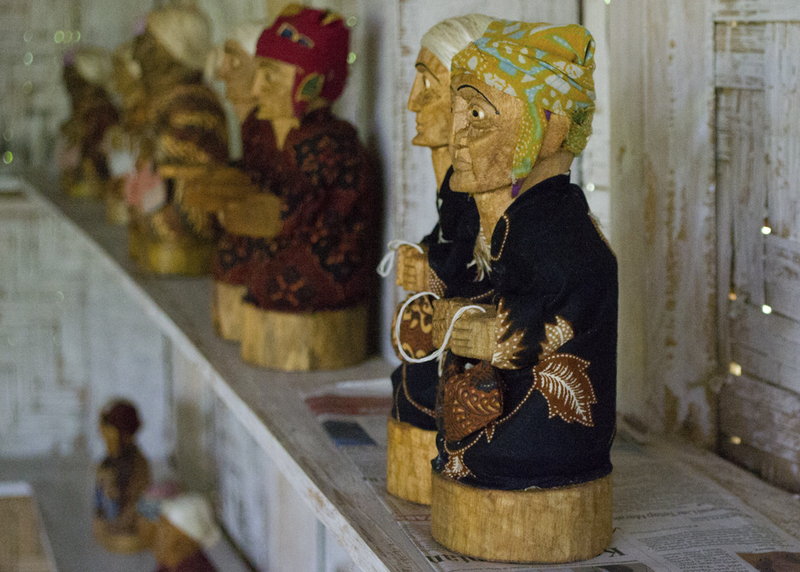 “A trip to Tana Toraja is like a National Geographic documentary brought to life” declares the Lonely Planet: Indonesia guidebook. 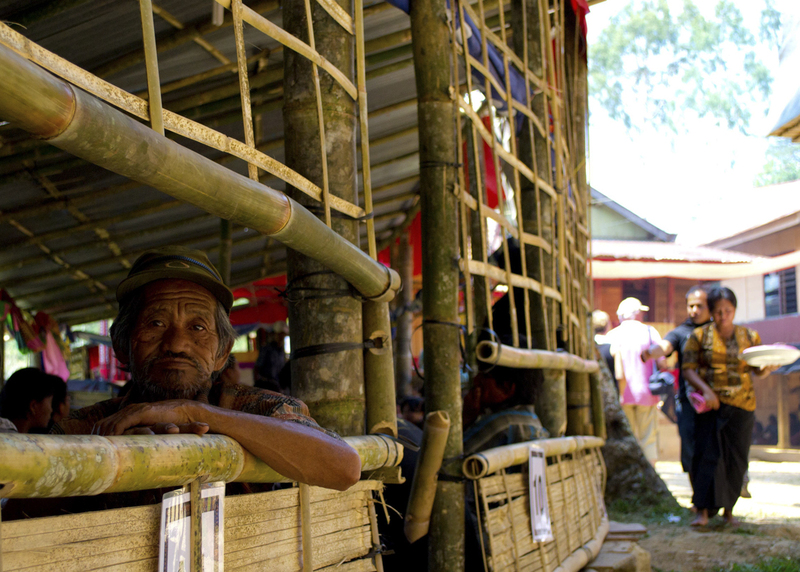 The elaborate funeral rituals that take place against the backdrop of the misty mountains of South Sulawesi strike readers as altogether fascinating. The guidebook conjures up enchanting images of a verdant land, terraced in rice paddies and sprinkled with quaint thatched homes. 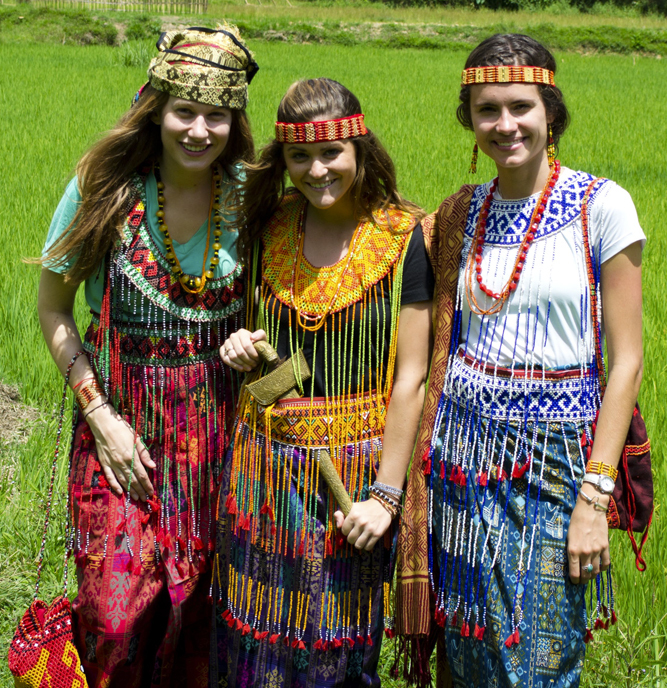 Lost in these romantic visions of Sulawesi, where hundreds of unique languages and cultures co-exist in a single, orchid-shaped island, Catharina and Catherine, living in Southeast and North Sulawesi, respectively, simply had to experience Toraja. Soon, the pages of the books they had studied began unfolding before their eyes. After renting motorbikes, the four zoomed by numerous tongkonan, traditional family homes used for ceremonies, their curved red canoe-like roofs standing out against the lush countryside. On the front of each tongkonan, the horns of kerbau (water buffalo) were stacked high. When Catharina asked a bapak about this phenomenon, he informed her that the more horns on display, the more wealth and importance that family has in Torajan society. The leathery kerbau roamed everywhere. The animals dozed in the shade just off the roadside, grazed in the rice paddies with white cranes nibbling flies from their backs, and splashed around in rivers. Kerbau are revered in Torajan culture, with the rare albino water buffalo fetching around $8,000. The group arrived at the funeral site, and as they inched closer, curious smells and sounds assaulted their senses. They heard the screeching of terrified pigs, the lowing of cows unaware of their future cameos, human chatter in bahasa Indonesia, the local Sa’dan Toraja, and various tourists’ English, Dutch, and French. The air was laced with aromas of charred animal hair, blood broiling in the strong sun, heady Torajan ballok, and roasted meat. Torajan funeral rites are key social events, and hundreds of people circled the main area, all watching the bloody ritualistic slaughter of dozens of pigs and cows, purchased by the family to honor the deceased. 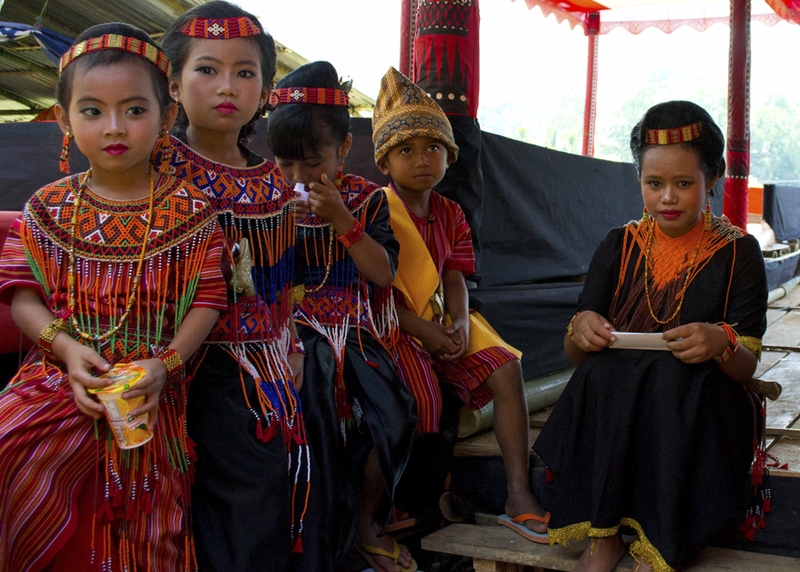 Torajan children, dripping in heavily beaded traditional garb, played in the sun as the family of the deceased ibu played music, gave speeches about her life, and barefoot men slaughtered the animals whose meat would be enjoyed only minutes later. Torajan funerals, tomate, often last several days and families save the remains of the dead for years, buried in small plots near their doorsteps as the funds necessary for the ceremony are raised. Given that Torajans believe death is a gradual journey toward Puya, the afterlife, this practice is in fact deeply rational. Seeking a better view, Catherine sidled around one of the large temporary structures built directly next to the site. A group of older bapaks saw her and invited her to come inside and sit on the soft woven pallet with them! “Silikan duduk!” The men spoke bahasa Indonesia and in a few minutes Catherine discovered that they were close relatives of the deceased – hence the excellent view. She asked if her friends could join. The family heartily consented, and Brooke, Catharina, and Ron settled in for a few hours of warming ballok, refreshingly bubbly palm wine, heavenly aromatic coffee made from the family’s own coffee beans, cookies, and the pièce de résistance — freshly roasted funeral pork stuffed inside a bamboo shoot. The friends laughed and chatted in bahasa while learning all they could about the music, marches, and rituals of the special event. The group had never felt more welcome and comfortable in Indonesia than during that special afternoon, when a family invited four strangers into their mesmerizing world. Catharina Damrell is a Fulbright English Teaching Assistant living in Kendari, Southeast Sulawesi. She graduated with a degree in environmental studies from Connecticut College in 2011. Damrell has studied the Bahaman Parrot in the Abaco Islands, worked on site with New Zealand wineries helping them become carbon neutral, and most recently spent a winter helping the Gulf of Maine Research Institute identify fish larvae. Contact her at cdamrell@alumni.conncoll.edu. Catherine Coverley is a Fulbright English Teaching Assistant based in Gorontalo, North Sulawesi. After completing biomedical research for the National Science Foundation, Coverley graduated from Loyola Marymount University with a bachelor’s degree in biology in 2008. Upon graduation, Coverley joined Teach For America and taught high school biology in Phoenix, AZ, while earning her master’s in science education from Arizona State University. In 2010 Coverley accepted a programmatic job with TFA, where she worked until 2012. Contact her at ccoverle@gmail.com.